Bangor's Nick Boudreau (center) moves the puck past Brewer's Jack Watkins (left) and Trey Baker during their hockey game at Penobscot Ice Arena in Brewer in this Feb. 8, 2017, file photo. At 6-foot-1, 255 pounds, Nick Boudreau is not your typical ice hockey center. The Bangor High School senior looks more like a football lineman in the image of his father, Perry Boudreau, who was an all-state player for the Rams. But don’t be fooled by Nick Boudreau’s rugged build. He is skilled and surprisingly quick for someone his size, and was an All-Class A North first-team selection last year. 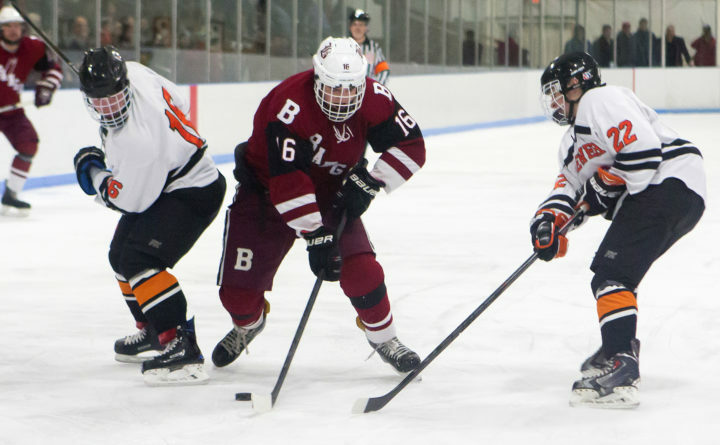 Senior center Nick Boudreau has been an offensive force and a strong leader for the Bangor High School hockey team. “He’s a great player,” Brewer High coach Lance Ingerson said. “He has good hands and speed behind him. He does a great job using his body to protect the puck. It’s very hard for defensemen to get around him to get the puck. His size is a huge asset, and he knows how to use it. Nick Boudreau, who was Bangor’s leading goal scorer (15) and point producer (24) last season, is on pace to eclipse those numbers this season. He has already posted 10 goals and nine assists for for the 7-1 Rams. In addition to centering the top line, he is a valuable contributor on the power-play and penalty-killing units. “He has good hand-eye coordination,” Lewiston sophomore Logan Tripp said. Nick Boudreau began playing hockey on the outdoor rink at Fairmount Park when he was 5 years old. His father said he took him to learn to skate at Sawyer Arena, and the slicker ice surface turned out to be frustrating for him. “He kept falling down,” Perry Boudreau said. But Nick Boudreau went back a few days later with his friends, and his skating improved. “You have to work at hockey to be good at it,” Nick Boudreau said. “I ended up falling in love with it, and here we are 12 years later. “I really enjoy hockey and if you enjoy something, you want to the best that you can be,” Nick Boudreau said. That kind of determination has been instrumental in his success on the ice. Nick Boudreau has a hockey net at home and often will work on his shot, taking some 200 shots a night. He regularly goes to stick and puck, which involves playing pickup hockey, and he goes to the rink four times a week during the summer. “He is very driven,” his mother, Beth Baldacci, said. Nick Boudreau played flag football in third grade but said it wasn’t his cup of tea. He eventually played soccer and became a golfer. He said his father did not exert any undue influence trying to steer him toward playing football. Nick Boudreau saw limited playing time as a freshman but was able to play regularly as a sophomore. He said that further ignited his passion for the game. “There was a lot of competition for those jobs. Ever since then, I’ve felt like a good part of the team,” he said. In the hope of improving, Nick Boudreau worked on his speed and passing skills coming into his final season. “My skating is one of the weakest parts of my game and something I can always improve on,” said Nick Boudreau, who relishes working on the chemistry of his line. Jamie Belleau, coach of three-time defending Class A state champion Lewiston, is impressed with Nick Boudreau. “He is strong on the puck and he has a good shot and good skills,” Belleau said after the Blue Devils beat Bangor 5-2 on Wednesday to stay undefeated. Bangor senior left wing Josh Sherwood said Nick Boudreau has “stellar hands” and called him a great leader. 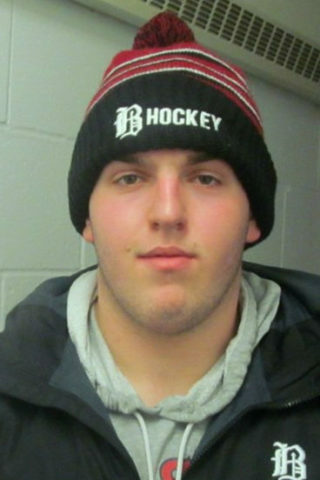 Nick Boudreau and the Rams were scheduled to play Cheverus of Portland on Friday night in Bangor.